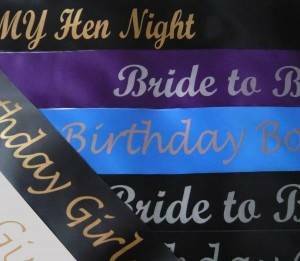 Without doubt, though, the most popular application for our printed ribbon is Custom Sash Printing. 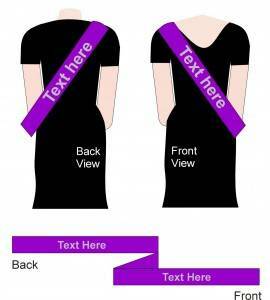 The sash is printed as a 6 foot long piece of ribbon, 4 inches wide. Or for those of you that are happier in metric, then this equates to approximately 1800mm x 100mm. To get the best out of the sash, we need to be able to fit the message on the main front or back area. We really want to avoid having print on the shoulder or down by the waist. This means that the effective area for the printed message is about 500mm x 100mm. Normally this would allow you to have one line of large text or 2 lines of smaller text. In the case of 2 lines of text we can, if required, make one of the lines slightly smaller than the other. The sash is then secured in place with self-adhesive hook and loop tabs. 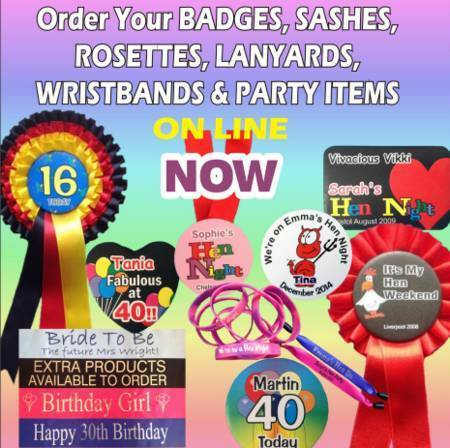 Printed ribbon finds applications in lots of different instances. You could get a repeated text pattern and then use the ribbon in 45mm width to decorate a wedding car. This looks particularly good with white ribbon and a metallic gold print. You could also get a length of printed ribbon in the 4 inch width (100mm). This can be used as a banner. Ideal if you want a custom banner for a birthday, for a retirement or any other celebration. It can also be ideal for a ribbon cutting event or for wrapping larger items. We've supplied quite a lot of ribbon already for gift wrapping cars !